Labor can make you feel like your bottom has gone fifteen rounds with a prizefighter and run the NY Marathon – all at once. And the simple act of sitting isn't simple at all. That's why is a soothing, comforting blend of wound-healing, styptic and antibacterial herbs and salts that have traditionally been used to support postpartum women. Time tested herbs help reduce swelling and speed healing of vaginal soreness, episiotomy and perineal bruising. Great for prenatal and postpartum hemorrhoids too. 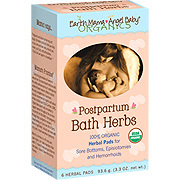 Organic Postpartum Bath Herbs - 6 ct is shipped in a discrete, unmarked package. Orders are processed immediately and usually takes about 3 to 5 working days to be received. We do ask that you try it for 2 to 3 weeks to feel the full effects. Any information received is used only for order processing and shipping purposes. Your information, such as e-mail address, will never be disclosed to a third party.